Fleece is a great fabric for dog wear. It’s super soft, cuddly and anti-pill, i.e. no bobbling whatsoever after a wash. It is lightweight – hard-wearing – washable – and water-resistant to keep them dry. Available in a large variety of colours and fun prints! The front has a velcro fastening – and the band round the middle wraps round the whole dog and coat for extra smugness also has a velcro fastening – quite a long one so you have a bit of adjustment. The fleece is edged with a contrast strip of fleece for strength and stability. 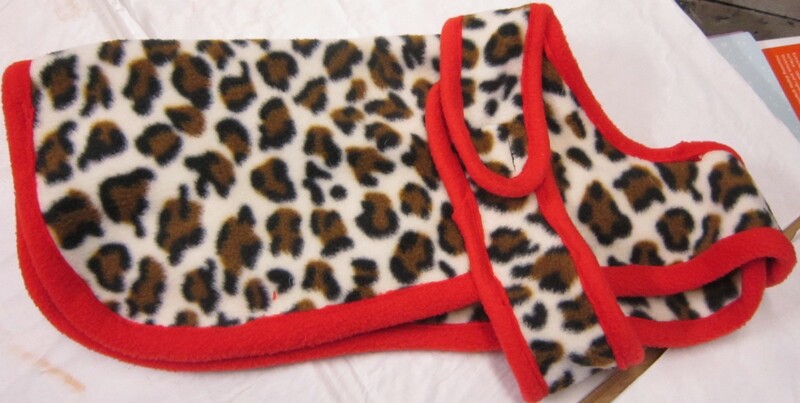 Handmade Posh Dog Fleece Coat – 024.